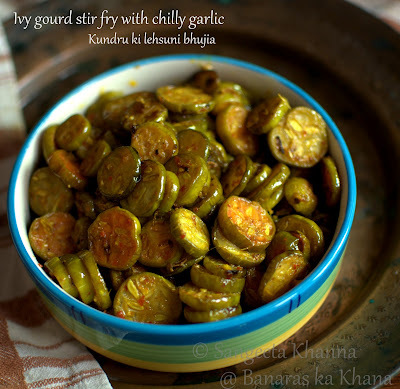 Kundru is also called as tendli, tindora or Ivy gourd. A vegetable you don't need to peel and that helps a lot when you eat loads of vegetables every single day. I love okra and green beans more for the same reasons. These vegetables can be cooked just after rinsing them well, I wont mind the stalk attached to my okra or even the green beans. Kundru or tendli has nothing to be discarded, such a good design by nature. just slice them in rounds or in wedges and stir fry whatever way you like it. Great source of soluble fiber and vitamins(A and C) and minerals. Good anti-oxidant food. The tiny Ivy gourds have potential to stabilize mast cells (related to allergies), good antihistamine and anti anaphylactic. It means it is a good choice for people prone to allergies as it modulates the immune system. These are considered to be good for glucose regulation for diabetic patients too. Read here and here. For diabetics and for everyone who is prone to allergies, kundru can be a good vegetable to be consumed 3-4 times a week. Here is an easy stir fry that cooked in about 10 minutes and takes about 5 minutes of preparation time. Kundru ki lehsuni bhujia ..
Rinse well, pat dry and slice all the kundru in thin rounds. You can keep them thick or just cut them all in irregular pieces. This bhujia can take it any which way. You can discard the pointed ends of the kundru but it's not mandatory. Heat oil in a kadhai and add the methi (fenugreek seeds). Wait till the become darker and aromatic, and then add all the sliced kundru. Stir well to coat with hot oil and add salt also. Keep stirring on medium flame till it starts looking glazed and brownish. Turmeric will be added as soon as the kundru starts getting limp. In the meanwhile make a paste of garlic and two types o chilies. This can be done in the chutney jar of your mixie or in a mortar and pestle. 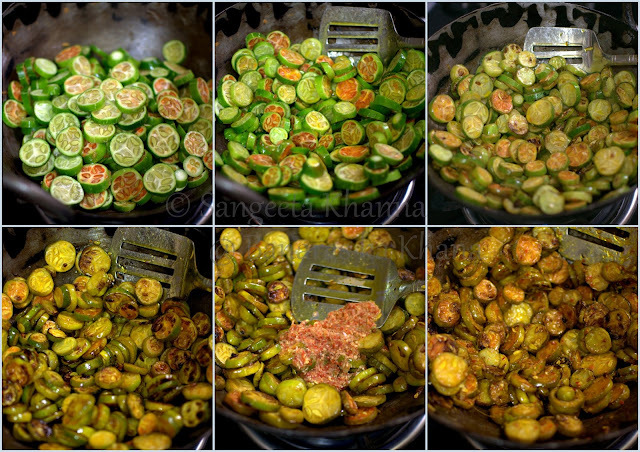 Add the paste as soon as the kundru slices are turning brown. Keep stirring and cooking for 5-7 minutes more or till the garlicky aroma feels good. Serve hot or at room temperature with daal chawal or with roti or parathas. It makes a nice lunch box subzi too. The slightly sour taste of the kundru complements the garlic very well. Chilly heat can be adjusted to taste but I like it fairly hot when having it with khichdi or daal chawal. Milder when I have it in huge amounts when I have my subzi based meals. I eat only subzi many times for a meal. There are a few more versions of kundru I cook, but all my versions are dry stir fries. Do you cook them in gravies too? Share your recipe if you do. Kundru...I have forgotten this little gem....I used to love having this. Thanks so much!! I made this yesterday- absolutely delicious accompaniment to plain dal rice. Thanks for the recipe. Can't I add 1 potato to the recipe??? Good recipe for suger pacitent . Awesome recipe. I used to cook this frequently.this is my favourite.